Topics: Inspiration, Statement Of Purpose, Staff, Nutrition, Recipes, and Complaints / Compliments. 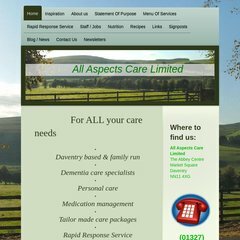 Allaspectscare.co.uk's server IP number is 87.106.170.232. It is hosted by 1 1 Internet Ag Baden-wurttemberg, using Apache web server. ns67.1and1.co.uk, and ns68.1and1.co.uk are its DNS Nameservers. PING www. (87.106.170.232) 56(84) bytes of data.